If you haven’t read the books, or seen the HBO series then you’re missing out the beauty and intrigue of Westeros, part of the world created by the “Great Bearded Glacier” George R. R. Martin. The stories tell of a great struggle for power between famous houses – and the men and women who lead them - competing to control the Iron Throne and the influence that comes with being the undisputed ruler of Westeros. 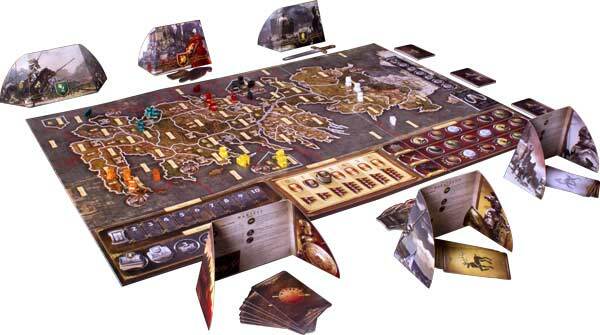 A Game of Thrones: The Board Game allows players to control those houses and fight great battles themselves, each for the ultimate purpose of ruling Westeros once and for all. Sit, and let me tell you of A Game of Thrones! AGoT is a territory acquisition game, a genre you should be familiar with if you’ve ever played Risk, Small World, Axis & Allies, or similar games of attacking, defending, and controlling spaces on a board. In AGoT players are competing to be the first house to control seven castles and/or strongholds, which are in territories strewn across a beautiful map of Westeros. If no player is able to control enough castles/strongholds to win, then the player who controls the most of them after ten full game rounds is the winner. I’ve played A Game of Thrones about a half-dozen times, and each time I’m infatuated with the quality of the pieces, board, and cards that go in the game. The board is absolutely beautiful – this really can’t be overstated. The cards are linen, the pieces are heavy, marbled plastic, and the art, design, and shapes painstakingly accurate. The quality of the components lend to a generally “epic” feel when AGoT hits the table. Teaching AGoT is a chore, even for a practiced game-teacher who knows the rules well. I’ve never played a game that I didn’t have to begin by teaching at least one player, so I’ve got my spiel down pretty well. It always takes about half an hour, at least, to set up the board, distribute the various and sundry components to each player, and teach the rules to the newbies (and refresh the veterans). While this would normally be prohibitive, I actually don’t mind it much, because it gives me a chance to literally and figuratively “set the table” for what should be an epic struggle of wills for the next 3-4 hours. A word of advice, for all you teachers out there – if you pick up AGoT, read the full rulebook cover to cover before you try to play the game. I generally feel that trying to teach a game while playing it for the first time is bad form for everything but the simplest games, and this is absolutely a game that could get bogged down in rulebook-referencing very, very quickly if not controlled well. Unless you’ve got a terrifically patient play group and a ton of time to play, I’d worry that you’d lose your group and they’d be hesitant to come back and try the game again, which would be an absolute shame. 1) Westeros Phase: A card is drawn off the top of three separate decks. The cards have varying effects, from granting additional power tokens (the currency of the game), to allowing players to “muster”, creating new units on the board, to forcing the players to bid on the “tracks”, which I’ll explain in a moment. 2) Planning Phase: Players place an action token (face down) on the board for each territory in which they have units. These action tokens are how players order their units to attack, defend, gain power, support other units, or raid adjacent territories. 3) Action Phase: When all action tokens have been placed, players flip them all over simultaneously and begin to resolve the tokens. I’ll explain the action phase in detail in a moment. The three phases are repeated for 10 full rounds, or until a player has control of 7 territories with castles or strongholds, at which point the game immediately ends, as stated above. Each of the phases allow players to strategize, negotiate, and make and break alliances that tend to determine the victor. 1) Movement: Pieces in the territory can move to another adjacent space, or through boats (called a boat chain) to non-adjacent tiles across water territories. If movement causes pieces from two families to be in the same territory, combat occurs and is resolved immediately (explained below). Movement tokens are flipped over when used (one-time use). 2) Defense: Pieces get a bonus to combat if the territory is attacked. These units can defend any number of times in the round, and the piece is only removed from the board if the units are routed and forced to leave the territory. 3) Support: Pieces can lend their combat strength to any combat in adjacent territories, friend or ally. Units can support any number of times per turn, but only once per combat. 4) Consolidate Power: Units perform no action and get no bonuses for the turn. Instead, the player collects power tokens based on the properties of the territory. If the “special” Consolidate Power action token is played, the player may instead choose to “muster” and place a unit or two on the board. 5) Raid: The units may raid a neighboring territory, cancelling out a support token, another raid token, or a consolidate power token. If a consolidate power token is cancelled, the raiding player receives a free power token, and the player raided removes one from his or her pool. Each player is given 15 action tokens, 5 of each type. Each type has one “special” token that provides a bonus or special action, and players use these special tokens are determined by their rank on the “King’s Court” track. There are three “tracks” in A Game of Thrones, and these tracks provide a great deal of the structure of the game. Places on these tracks are assigned when the game begins, and are only changed when players bid on them during the Westeros Phase, as prompted by certain cards. The “Iron Throne” track, which represents the houses’ power over the throne and determines turn order in AGoT, the “Fiefdoms” track, which tracks players' combat prowess and determines the winner of ties in combat, and the “King’s Court” track, which ranks families' secret influence over the happenings in Westeros, and gives players access to specific numbers of “special” action tokens. Each of these tracks has its benefits afforded to players high in ranking, and each provides a unique ability for the player at the head of the track. The house that holds the first spot on the Iron Throne track receives the Iron Throne token, and decides the winner of all non-combat ties (like players bidding on their spaces on the tracks, or determining who gets helped or hurt after fighting Wildlings). 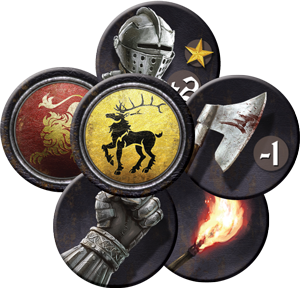 The house that holds the top place on the Fiefdoms track receives the Valyrian Steel Blade token, which affords the player the right to add one point to combat once per round. The player also wins all ties in combat, based on having a higher rank than any other player on the track. The house with the most influence over the King’s Court receives the Raven token, which provides the player with additional information in the game (Ravens are the messengers, and bringers of omens, in Westeros). The holder of the Raven token may, once per turn, switch one of his or her action tokens after all action tokens have been revealed at the start of the Action phase. 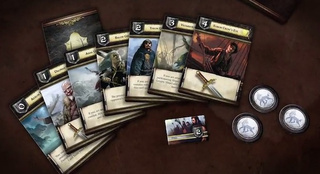 Alternately, the player may instead choose to secretly view the top card of the Wildling deck, which affords a particular advantage when players are forced to band together to protect their mutual interests. During each Westeros Phase, it’s possible that cards could be revealed with the Wildlings token symbol on them. Each time this happens the Wildlings token is pushed up the Wildlings track, and in the event that the token reaches 12, Wildlings immediately attack Westeros from the north. Players each bid power tokens (the same tokens used to bid on the influence tracks), and if the combined total of all bids is equal to the current number on the Wildlings track, the barbarians from the north are repelled and players rejoice, possibly sharing in some mutual benefit. It’s also possible that the player who bid the most could receive a special bonus, though not guaranteed. On the flip side, if the players fail to beat back the Wildlings, bad things almost surely happen to everyone, the worst of which happen to the players who helped the least. This semi-random combat with Wildlings provides the only true cooperative moment in A Game of Thrones, and lends itself to some interesting moments of self-preservation. I’ve found that it’s usually discarded as unimportant until it happens, and the players who plan well for it are occasionally awarded with benefits – like extra units, extra power tokens, or a new place on an influence track – that materially change the game. Don't let the rose fool you, House Tyrell can get thorny. As stated above, combat happens when a house moves its units into a territory controlled by another house. Combat involves absolutely no variance or random components, and is resolved in three steps; first, players compare the total power of their units in the territory (Footmen: 1, Ships: 1, Knights: 2, Siege Engines: 4, only when attacking a castle or stronghold). Next, players add to this total the combat value of any supporting units. Last, players play one “house card” from their hand. When both players have selected a house card secretly, they are both revealed and their immediate effects, if any, are resolved. Their power is added to combat, and the house with the highest combat value wins control of the contested territory. If there is a tie, the player whose house is higher (has a lower number) on the Fiefdoms track wins the combat. All losing units are “routed” and move into neutral or friendly adjacent territories, and if attacked again in the turn are immediately destroyed. If the house card played by the winning house had one or more “swords” printed on it, then that many units is destroyed (the losing player chooses which units to destroy). This can be countered by playing a house card with “towers” printed on it, each of which cancels out a sword. Swords only result in destroyed units if the house wins the combat, and most often combat simply results in units being routed and retreating to fight another day. Each house starts with 7 unique house cards designed specifically to represent the house’s place in Westeros, and they are designed to encourage players to play the game the way their houses perform in the storyline. It’s an incredible bit of design and really shines when combat happens often – it becomes very obvious which houses succeed in being aggressive, which are defensive stalwarts, and which are cunning and influential. House cards are discarded after use and are only returned to players’ hands when the last house card is used and discarded, meaning that the decision to use a house card is critical and often provides the real drama in combat. don't screw with them. Just ask Theon. It’s incredibly important to know the cards your friends and foes have and how and when they’re most powerful, as those cards routinely push combat to one side or the other. I’d say this is the most important part of A Game of Thrones – if you don’t manage your house cards well, you’ll get absolutely crushed in combat over and over again and you’ll be routed before you have a chance to glimpse that sweet throne made entirely of swords. ...we have a full six players engaged and battling hard to win the game. The board and families starting positions are built so that space is scarce and alliances are incredibly important. It’s very, very hard to maintain a continuous advantage, and it tends to be true that the first player to become the obvious leader in the game, particularly early in the game, gets knocked down by the combined effort of his or her neighbors. The winner is usually the player who most deftly negotiates and conceals plans until the final rounds. This kind of subtlety and planning is rewarded well in A Game of Thrones, and when done well it’s incredibly entertaining. ...players get frustrated and disengage, or lose interest and don’t pay attention or have to constantly be reminded of their choices and turns. This is a long game, longer than any other I’ve played, though not of Twilight Imperium magnitude, and that can make a casual player uncomfortable. I tend to stress strongly that the game WILL take 4 hours to play, and I don’t often take AGoT with me to board game nights because it’s a little frustrating to set the game up, teach it, and not get investment from my friends. It should also be said that though there’s technically no way to eliminate a player due to the rules of mustering, if a player is too aggressive early, or plays poorly in the first few rounds, it can feel like they’re out of the game. I’ve had this happen to me, and I’ve found that when I stuck it out and played the game… the game of thrones… I could scratch my way back into contention with a good plan and the proper amount of begging and pleading. Still, if you’re not the kind of player who plays well from behind, or if your friends get frustrated easily, be warned. If you’ve got a good group of friends who enjoy deep games and love to negotiate, you should absolutely own A Game of Thrones. It’s simply beautiful, the game play is elegant and interesting, and the relative lack of variance (no dice, few random card draws) provides players with real control over their fates. If you dig territory-acquisition games and can talk your friends into spending 4 hours learning and playing one, you won’t have a better time. You're fighting over this. It's made entirely of swords. I assume sitting on it hurts. As an aside, I think AGoT provides the best value in terms of components that I’ve ever received in a game. The base game costs $60 (there are two $15 expansions as well, both worth purchasing), and for that price you receive a gorgeous game with heavy pieces and beautiful art and cards. This is a game I will always own and get to the table as often as I can with the right play group. If you’d like to take a shot at seizing the Iron Throne, come find me, and let’s play A Game of Thrones!